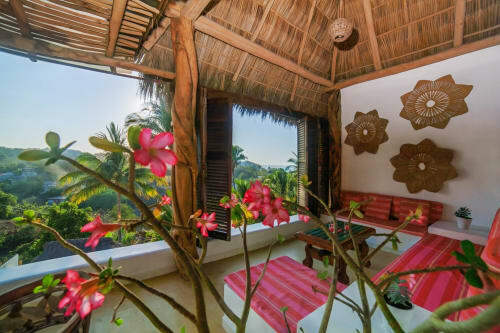 Casa Cupola and Casita Mariposa in Sayulita are your perfect vacation homes! 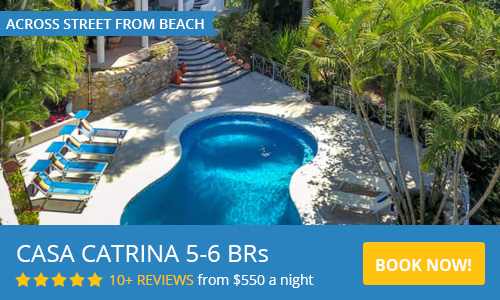 Escape to paradise and book Casa Cupola - spacious 2BR, 2 Bath house with the beautiful tropical garden or Casita Mariposa - charming 2 BR, 1 Bath vacation rental apartment in Sayulita! This lovely gated property is a 15-minute easy walk (no hills!!) to the beach and offers incredible views of the jungle and mountains. You can rent the house and the casita together or separately - they are totally independent with separate entrances. CASA CUPOLA was named for its unique Brick inlaid arched ceiling or "Cupola," which arches over the living room and kitchen area for a wonderfully luxurious atmosphere and is usually only found in churches. This spacious house with private entrance and a green garden is a perfect place for a family or someone who seeks a peaceful vacation. Master bedroom with queen size bed has an en suite bathroom and the second bedroom is located down the hall right next to the living room and in front of the second bath (with the bathtub!). This house features AC only in the bedrooms and ceiling fans all over the house. Comfortable living room and well-equipped kitchen will make you feel at home and let you prepare your fresh juice, coffee, and food whenever you want. You will enjoy your meal at the inside dining table, one of the seats at the kitchen counter or in the garden. When it's time to relax, you can head into the living area or step outside where you'll find multiple areas to unwind in the private backyard. After cooking out on the charcoal grill, you can spend time catching up with your travel companions at the nearby patio table. For a truly relaxing time, the shaded hammock is the perfect place to enjoy the breeze and listen to the sounds of nature. Take your favourite cocktail out to the patio table in the yard and revel in the peace and quiet as you're surrounded by lush plants and trees. CASITA MARIPOSA - charming and colourful second-floor independent apartment is boasting an open floor plan and bright, Mexican-inspired decor, breathes a tropical getaway ambience! The first thing you'll want to do when you arrive is head out onto the L-shaped deck to admire the views of the jungle and mountains as you enjoy the refreshing ocean breezes. After a long travel day, relax on the sofa in the living room before preparing a meal in the well-equipped kitchen. The multiple ceiling fans in the unit are sure to keep you cool on hot Mexican days! When it's time to get some rest, head into one of the vibrant bedrooms for a peaceful slumber in one of the cozy beds. Both bedrooms of Casita Mariposa have king size beds and there is one spacious bathroom for your comfort. This Casa can accommodate a family of up to 6 people with an extra charge $15 USD per 5th and 6th person. There is a couch for one extra guest and we can provide a baby mattress available upon request. The amazing apartment's amenities included beach chairs, beach umbrella, ceiling fans, coffee maker, free WiFi, linens, mountain view, patio, patio furniture, and towels. There is no AC in Casita Mariposa but due to its location on the second floor and fans all over, it is quite fresh and airy. There are different prices for renting Casa Cupola or/and Casita Mariposa and discounts for a longer stay. Please check the PRICING tab for more info and use the contact form to reach us with any questions. 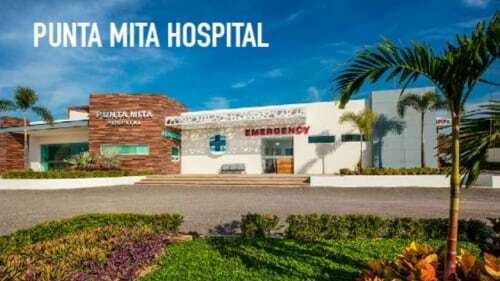 Great location and very affordable for the wise traveler budget! We Loved Sayulita and Casita Mariposa was a great base camp for us. We spent most of our days at beach surfing and sunning but so nice to come home to the breezes on the second floor balcony! Where we watched sunsets from lounge chairs and the hammock! The Large bathroom is like a Bedroom with 2 sinks and kitchen was fully stocked with many things to make our visit enjoyable. We will tell our Friends back home in Canada this is a great location and very affordable for the wise traveler budget! We had a great visit at MARIPOSA in Sayulita and really enjoyed our stay. It was a perfect location for us - secluded and private and yet easy to walk into town or the nearby beaches. Unlike friends of ours who had to get a rental car to go up and down steep hillsides, we were close to everything and yet conveniently able to walk everywhere. We’ll definitely be back as Halo and Arturo, the caretakers are so friendly & helpful. Their local knowledge really saved us a lot of time and money! Seasonal rates are per night and in US Dollars. Rates are for 4 guests. Maximum 6 guests and there is a $15 USD charge per person per night for the 5th and 6th guest. Halo and her husband Arturo have been calling Sayulita their home for the last 10 years.They own a local business: Sayulita sushi delivery and sayulita Tunaburger.They look after this property and try to be as helpful as possible while giving their guest space and privacy.